We were starting to wonder where the low season had gone. The month of May was mostly dry apart from a few wet days towards the end of the month (see May 2013 : Start of the Low Season). May is on average the 3rd wettest month of the year, but the total I measured at our house this year was 100mm compared to an average of 265mm (see Phuket Rainfall Averages). And so many hot days ... the big reservoir at Bang Wad, in Kathu district near Phuket Town, is looking rather empty. 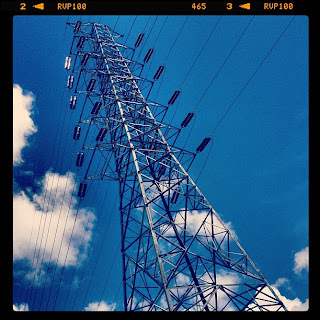 For regular Phuket weather news, Phuket news, photos and more ... please do follow me on Instagram and Twitter, thanks! June 1st was actually a nice sunny day. Kids went for their rock music class in the morning, and my wife and I went for an iced coffee at the Tunk Ka Cafe on top of Rang Hill in Phuket Town. We'd not been for a long time and decided to go back with the kids later for a sunset dinner. The rain came in the night, about 40mm total. The 2nd was grey and damp to start but again, a mostly sunny day. 3rd June (from Twitter) I got my running kit on at 6:45am, but saw dark clouds coming over the hills. It only rained a bit. And then .. all change again. Rain gone, sun returns. With a bit of cloud and maybe some bits of rain here and there. But no rain measured at our house. 5th June : Sunny at my house right now, but I can also see dark clouds. Another low season day with random weather. 6th June : Looks like another grey/blue sky morning in Phuket. 7th June : Sunshine and blue skies to start the day in Phuket. Lovely weather, but be careful of big waves at the beach. And yesterday, well it started very nice, a lovely sunny day. But then WHAM! Here comes the real low season! We just went out in the evening, stopped for a quick bit of shopping... the rain was very very heavy around 8pm. 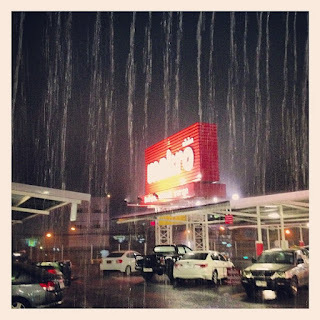 (above) Heavy rain at the Makro supermarket outside Phuket Town. The noise of the rain on the roof was deafening! The roads were very wet when we drove home, the rain had come very heavy, very quickly. You can call it "floods" if you like, but "floods" in Phuket don't last more than a few hours, then the rain drains off to the sea. Some areas are worse than others. 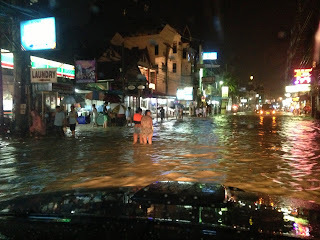 Patong is always the worst, being that its a concrete jungle with inadequate drainage. Happens every year. 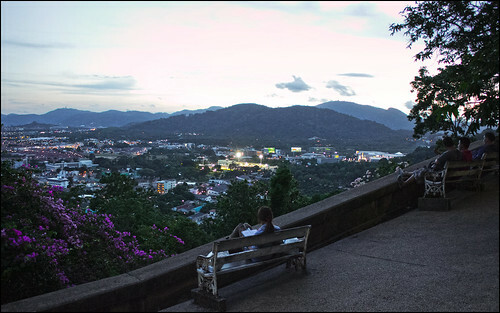 A couple of photos below from The Phuket News website and The Phuket News on Facebook. 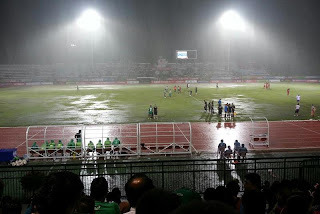 (above) and the Thai Division 1 football game between Phuket FC and Rayong was postponed halfway through. Too wet. 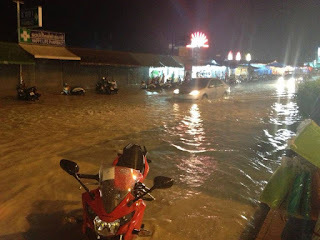 Looks worse than it really is ... this is just a few roads in Patong, not the whole island. I was out in the rain and had no problem driving home. 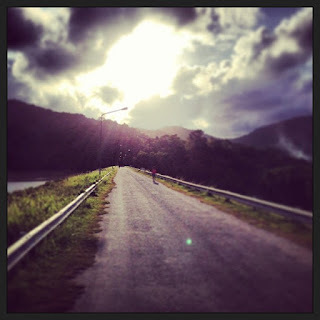 And this morning, roads were dry on the way from home to Karon Beach (20km drive). Today has been mostly grey and wet. Forecast is for a wet week. 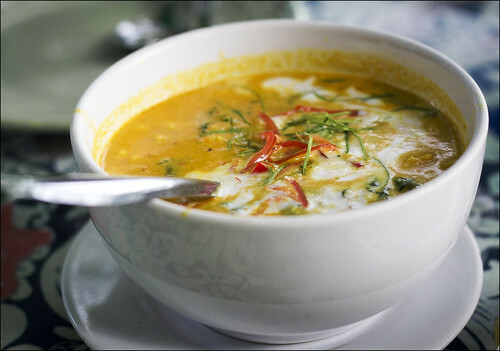 If you are here, I refer you to the link at the top of the page .. what to do on a wet day in Phuket! If you are coming next week, it'll probably be sunny again. But exact weather predictions are impossible at any time of year. It's low season, I think you can see from this blog - you can get sun, rain or something in between, but at least the hotels are cheap!